The entire Ultima series is near and dear to my heart, but none more than Ultima V – a game I spent over five years of my life striving to recreate via a Dungeon Siege mod called “Lazarus”. What makes Ultima V so special? While the first three Ultima games established foundational design tenets for CRPGs in general, and Ultima IV pioneered the concept of morality in games, Ultima V was the first RPG to introduce true world simulation. By “world simulation,” I mean the collection of systems which grant players the illusion of a living, breathing world that exists independent of their actions, rather than simply a game board upon which the player can stab monsters. Earlier Ultimas had already introduced primitive day/night cycles where visibility and monster spawning varied based on time of day, but Ultima V took that a step further and introduced NPC scheduling – merchants get out of bed in the morning and walk to their shops to open for business, while guards close down city gates after nightfall to keep out wandering monsters. On top of that, environmental objects were actually recognized by the game for the first time – each potted plant or bookshelf wasn’t just a painted bit of the background, but a physical thing you could move around. Harpsichords could actually be played, and a careful look through the game’s manual could teach the player how to play a specific tune with special effects in the game world. While this sometimes allowed for puzzle solving, it mostly just served to make the game world feel more real and to give players more opportunities for interaction. And that was the beauty of it – Ultima V was perhaps the first time a game designer realized he could generate a tremendous amount of fun by simply creating an immersive world with some limited agency and letting players run wild. The groundwork laid with this philosophy would later emerge (with improvements) in everything from Grand Theft Auto to Skyrim. On top of its accomplishments in world design, Ultima V pushed forward on the narrative front, turning Ultima IV’s focus on virtue upside-down as Lord Blackthorn – the prime antagonist of the game – codifies the eight virtues of Ultima IV into draconian laws. To some characters you meet, Lord Blackthorn is a vile usurper and his laws are unjust, while others are benefiting from his rule and see the player character and his friends as dangerous outlaws. You play a Robin Hood-esque role, never entirely certain who you can trust and who might turn you in to the authorities. This situation leads to interesting questions like “does virtue still have meaning when compelled?” and introduces shades of gray to the moral equation of Ultima, creating situations where “what’s right” isn’t always readily apparent and keeping players on their toes. 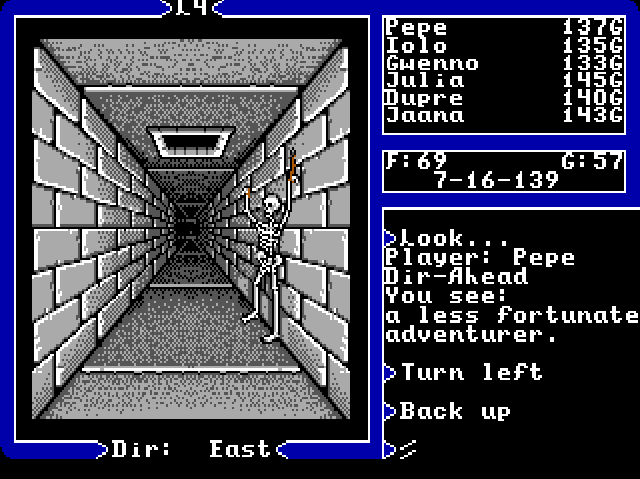 Another place Ultima V worked wonders was in the Underworld – a massive new region added to the game world for the first time in the series. The Underworld was a sprawling cavernous region every bit as big (and as open) as the surface world, linked to the realm above by a network of dungeons. The impetus for the game’s story is the disappearance of the rightful king (Lord British) into this shadowy expanse, and the developers of Ultima V used this fact as an opportunity for immersion by providing a written chronicle of the king’s expedition into the darkness. Smart players could read carefully through the chronicle and use its words to guide them in-game as they followed the lost king’s footsteps. The ensuing connection between shared experience of the real player and the character they controlled was remarkably powerful.